to create an amazing event, ​one that reflects your style and vision. 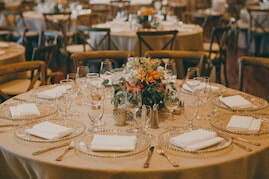 ​Creating an event to remember is our priority! Whether your event is personal or business related, Simplest Details has a team of amazing event and wedding decorators ready to take your event from ordinary to extraordinary. Weddings, corporate events, private parties, fundraisers, our team has done it all! We offer day of event coordination, event decorating services and wedding décor rentals. 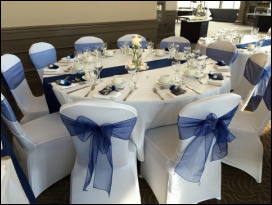 Need chair covers, sashes or table runners? We’ve got the perfect colours. Creativity, attention to detail, outstanding customer service and value pricing. Our full-service Event and Wedding Decor decorating leaves you free to enjoy your day while we prepare the venue with your dream décor. ​This means you can focus on yourself and relax knowing that everything will be ready for your party when you get there. For clients who are happy to take care of set up and take down, we offer a wide range of wedding décor rentals that will transform any setting. Our three styles of chair covers are our most popular decor item and are the fastest and most inexpensive way to dress up a room. glamour to your decor. Contact us to inquire about rental.